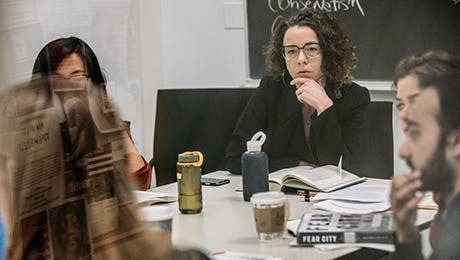 Persons who have not been admitted to a degree program at The New School must apply for and be admitted to non-degree student status in order to register for New School for Social Research courses. Please contact the Office of Admission for application instructions. A complete non-degree application consists of the Application for Non-Degree Study form, a $50 application fee, an official transcript indicating conferral of a bachelor's degree, one letter of recommendation, and a one- to three-page statement of purpose. You can apply for non-degree admission using this form. Non-degree students are limited to a maximum of two courses in a semester, and a total of three courses altogether (two in one semester, one in the other). Non-degree students who take only one course in each of two semester have also reached the limit of non-degree study. Non-degree students who wish to enroll for a second semester are required to submit a new Application for Non-Degree Study form listing the course or courses they wish to register for and to receive departmental approval to take the desired these courses. They need not submit supporting documents again or pay another application fee. Admission to 6000-level courses for non-degree students requires approval from the course's instructor prior to registration. Admission to 7000-level courses is not open to non-degree students. Non-degree students have full privileges at New School libraries and academic computing facilities. If subsequently admitted to a graduate degree program, they may petition to have credit earned during non-degree study applied to the degree program. Non-degree students may audit courses only if they take a course for credit during the semester in which they wish to audit a course. The audited course counts as one of the two courses they are permitted to take. Unless specified otherwise, non-degree students follow the same policies as degree students for course grades and other matters.